By happenchance our paths crossed with Magda Gerber. A spark was lit and, with a little help from our friends, the flame ignited. Now every member of the center team is Resources for Infant Educarers (RIE) trained and the Infant Environment Certified by RIE. When teachers from other centers visit, they often ask HOW? How do you get your co-teacher to buy-in to trying the RIE principles of caring for babies and toddlers with respect? 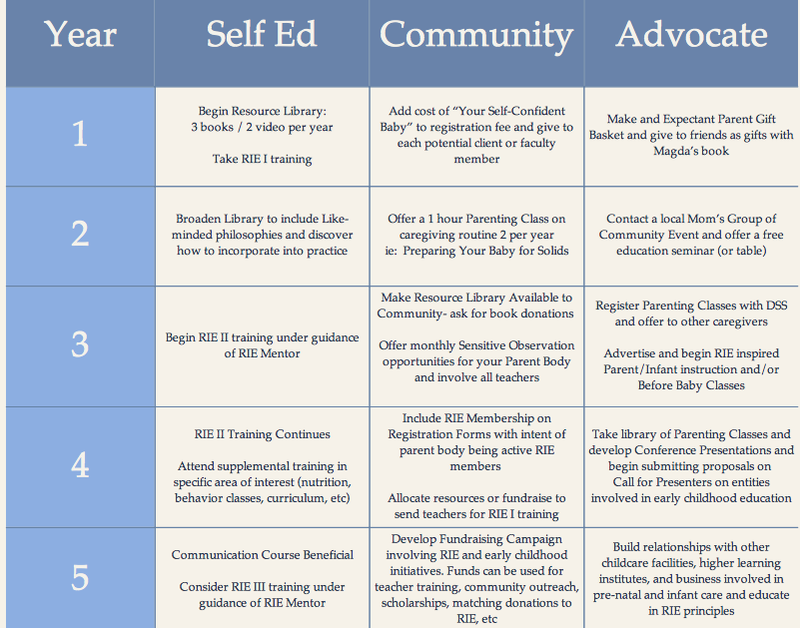 How do you communicate with parents the benefits for using the RIE Approach at home? How do you wean a program off the need for bouncy seats, high chairs, or pacifiers? How do you do primary caregiving? …keep the children together for two years? …get the parents to respect your caregiving routines? And ending with a team of 15 RIE Trained Early Childhood Professionals committed to demonstrating that we need not compromise quality or best practices in center base care. In fact, we can not. This little one takes full advantage of the floor bed placed on the adjacent outdoor porch. Oblivious to her friends playing nearby, she lets go to the urge for a mid-morning rest preferring the outdoors to her indoor sleeping area. Her friends play on barely glancing as they pass and seemingly careful not to disturb. MMP – 2014 Graduate Movie Presentation from Sunhead Projects on Vimeo. Childhood friendships endure a life time- especially when they are nurtured from the start. We celebrate our Kindergarten Graduating Class of 2014. And thank you for your many contributions to our center community. Sometimes, it’s easy to forget that parents don’t have the same working knowledge we do as daily practitioners. Recent Parent Teacher Conferences revealed that while parents trust us with the care and well-being of their little one, they still want to know some finer details on putting theory into daily practice at the center. Like- How DO teachers get breaks, how often, and who watches their child in their absence? (Short answer- we try to plan around rest times or down times and have an extra person on faculty to support). We chose ten frequently asked questions from our conference time together to share with the greater community. Yes- nap room are staffed at a different ratio than non-nap times for children within our Toddler and Primary environments. The center maintains ratios at or below South Carolina state mandated requirements. In the infant environments, the children are on individual routines and a fifth support person is warranted. With older children, we have some flexibility during rest. Yes! While washing dishes is an integral part of the Practical Life curriculum in our classroom, it is the responsibility of the adult to maintain health and safety. All dishes are re-washed in our DHEC approved kitchen using a 3part sink wash and sanitation cycle. This is true with any practical life activities with which you may see the children engaged. Their involvement cultivates a sense of community and belonging while positively affecting independence, order and concentration. It is the adult responsibility to maintain a clean and sanitary environment. Children are welcomed into the community a variety of ways and times throughout the morning- first by being greeted upon entering by the drop off coordinator. Then, depending on the child or family routine, they may connect first with their primary teacher before venturing off for the day or be welcomed individually as they enter proximal to the teacher who is zoned to monitor safety. At 8:55am we begin our morning transitional song and greet our entire Toddler and Primary community together to start our day during the Flag Ceremony. Throughout the day, we model and reinforce this and other Grace and Courtesy exercises inherent to our culture. One of our greatest challenges is communicating all of the activities taking place at the center as each day is rich and varied from the last in activity and your child’s developing needs. The children learn collectively and individually across all planes including physical, social, emotional and cognitive. Each year we summarize our documentation and provide a comprehensive review and narrative for parents to serve as a resource to for your family in understanding your child’s temperament, strengths, areas they are working on, learning style, and unique characteristics. Antedotal information may be shared daily as we connect in person. Periodically we will reach out by phone or email using class notes to share general information. We also offer community meetings and adult education. At the primary level, we offer classroom volunteer ops. 1. Instead of asking a question like, “How was your day?” Try sharing a short story about your day. Your child might not even need an invitation before sharing one of her own. 2. Linger a little at pick up- arrive a little earlier for pick up and sit quietly on the playground. You may even be able to observe before your child notices you. It’s much easier to linger at the end of the day then break the morning routine, but sometimes that works in the morning as well. Some children will explore power- either physically or socially- and may need additional scaffolding to understand expectations. IF, WHEN, and HOW to intercede when a child is mis-using words is treated similarly to when they are acting harmful to another physically. Sometimes, it’s just a manner of explanation and learning. Sometimes, a child may need to be more formally directed with role playing to learn. Sometimes it may even result in a loss of freedom. Children are not allowed to hurt another person either physically or emotionally- it is our job to keep them safe. We believe YES- although there is some debate on that topic. Our teachers are multi-trained and certified in a variety of approaches, including those involving sensory or learning differences. It is our goal to offer in inclusive environment and teach to a chid’s strength while supporting him/her in areas they are less strong. 1. The rules and expectations at home are so different from that which is expected at school that the child does not understand the expect ions which results in him/her testing limits at home and and at school in an effort to understand the social norm. Parents must choose a program that matches their style and value system. 2. Children are exposed to media (t.v., computer, screen time) to a degree that negatively impacts their social and cognitive learning. WE STRONGLY ADVISE NO T.V./SCREEN TIME BEFORE THE AGE OF SIX YEARS. Research currently is coming out stating that even small amounts before the age of 8 will negatively impact the physical development of your child’s brain Some children seem more prone to these effects than others. Why don’t you expand your school? There is certainly a demand, especially for infants. For much of the same reasons above, we have no intent to expand our program. We feel “efficiencies of scale” should not apply to schools and that bigger is not better- in fact, it’s harmful to our social fabric as well as the education of the child. In a world where schools and even daycares are getting bigger and bigger, we think that, in time, others will see that the greater benefit is in cultivating small, community based schools with a community of parents and educators who share like values- be it Montessori, religious, traditional, Waldorf or otherwise. We’ve actually already begun to see this trend. Instead, our “expansion” efforts are towards supporting early childhood educators and resourcing parents. We advocate beyond our facility walls and would like to continue expanding into the area of training and consultation. We see our greatest attribute to be the ability to mentor other programs and help them cultivate an community of best practices. We have three mentor master teachers certified to train in the State of South Carolina on the topics of curriculum, child development, and health and safety. Transitions. Change. That can be a tough one. Consider your child and the change and transition she will experience over the course of six years from infancy through Kindergarten. It’s amazing. It’s a miracle. The environment most assuredly will change and transition to meet her developmental needs. But how- we only have technically three environments: infant, toddler and primary? Many times you’ll witness a transformation over the periods of time as the rooms change and develop to meet the diverse needs of the group. We have a storage unit packed full with at least two additional classrooms of materials and furniture which we rotate as needed. Where other programs separate children by infants, creepers, walkers, toddlers, 3s, 4s, 5K….. we keep our peer groups together, ideally with the same teacher and hopefully as they do make that physical transition (there are only two) from the infant community to toddler and then from toddler to primary during the normalization process. But that doesn’t always occur. The early childhood profession is known for having high staff turnover. The work is intense and often times the educators are not supported. However, our center has relatively low teacher turn over. In the event a teacher does leave the center, we make every effort to minimize any negative impact this may have on our community. During the time when we are making our hiring decisions, you may meet several candidates who undergo an intensive interview process and then 90 day probationary/training period before they are able to fully take on a primary role. YES! But only if your child wants a hug. Each child is different and it’s important to respect that children, like adults, express their emotional needs differently. Our response depends on the child, but you do see a lot of hugging going on at the center. Sometimes a child expects a hug as a greeting and will approach her preferred adult who comes down in exchange and welcome. Sometimes, we’ll be working with another child or observing when we are approached for a spontaneous hug. Or, if a child falls and gets hurt, we may open our arms and invite a hug of support. When we don’t give hugs- We don’t ask a child to give us a hug if the need is our own. But remember those spontaneous hugs previously mentioned? Sometimes we don’t need to ask : ) We don’t ask children to hug another child in an apology – but those spontaneous hugs apply here, too. And if a child is hugging another child who does not want to be hugged, we will ask them to respect the other child’s wish. Or if we are giving a lesson or need our own personal space, we may ask a child respect that. What if my child wants to stay outside all day? When will he learn? One of the most unique experiences at the center is the ability for your child to be inside or outside throughout the day whenever he wants. This is an important value for so many reasons…. we could literally write a book on the topic. The short reply is that we have designed both our indoor and outdoor environments to link. In this way children are free to play and move indoors and work alongside a teacher with lessons outside making it difficult to separate learning and play. Thanks to all the parents for participating in Year End Conferences. We always look forward to our time together. We hope that you enjoyed the experience and that most of your questions were answered. Please let us know if we can be of further service. Is he happy… Is she relaxed… Does he get along with others… How does she approach struggle… Does he know how to resource himself? These are the true indicators for life long success.